++ TOKIO HOTEL Liebe Immer ++ » Most Dedicated Superfans! Which Band Has The Most Dedicated Superfans? It’s that time again. We’ve asked you Which Band Has The Most Dedicated Superfans? and Which Teen Idol Has The Most Dedicated Superfans? and the responses were overwhelming. Tonight NKOTB, a band with a tribe of major superfans, is performing on Late Night and I expect some major superfanning to go down at 30 Rock. 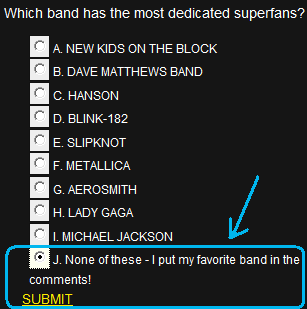 So once again I ask you….Which Band Has The Most Dedicated Superfans? we all know THey should be! THEREFORE HAVE THE BEST, MOST DEDICATED SUPERFANS!